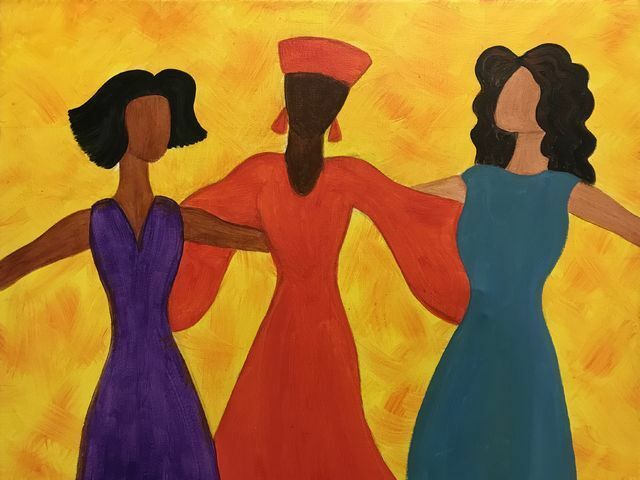 You'll have fun creating this painting that's sure to make you happy while you're learning to paint it and after you take it home from a great evening of music, laughter, and creativity. Our instructor will guide you through the brush techniques, color mixing, and painting techniques while you relax with some background music in our bright contemporary studio with some new friends or old ones. And as always at Dabble Studio, WE STENCIL THE MAIN LINES OF THE DESIGN ON THE CANVAS FOR YOU BEFORE CLASS! We supply all of the materials you need - 16 x 20 canvas, paint, brushes, and an apron, together with wine and bottle openers, wine glasses, ice buckets, and ice. You'll leave with a great piece of art, a sense of accomplishment, and of course, a stronger sisterhood! You can arrive as much as 30 minutes before class time to get set with an apron and uncork your bottles, set up your snacks, choose your seat, or meet up with other painters. A small selection of beverages, including wines by the bottle, moscato by the glass, bottled Stella Artois beer, soft drinks, and bottled water are available for purchase at our studio. Plus, Jamie's delicious house-made pimento cheese and crackers will be available for purchase at the start of class. No more rushing to get drinks or snacks before class. Leave the food and drink to us and enjoy snacks and some refreshment while you paint!